Shows the total amount you have of items. The actual items may be in your bags, banks, or on one or more of your alts. Supports usable items, quest-items, and more. LootCount displays item-counts in a variable interface. Just drag an item to the interface and go loot stuff. LootCount can be as big or small as you want, and it has been tested with 100+ items. If you are installing LootCount for the first time, read the section "First-time install" below. Read the section "Quest-items" below. This is an empty slot that will not display anything, and it is to be used as a spacer between items if you feel like being tidy. Spacers should be assigned to a shortcut key in the WoW keybindings for quick access. It is also accessible with the command "/lc div". When the available spaces becomes visible, just click where you want the spacers just as you would with a normal item. This plugin is explained in the plugin-section below. LootCount is not visible the first time you install it. Show/hide LootCount by typing "/lc". This can also be assigned to a key in the native WoW key-binding options. LootCount will appear in the middle of your screen as an empty green frame. This frame can be moved by dragging it by the corners (and ONLY the corners). Place it somewhere and drop an item on it. Drag a new item to the LootCount interface, and drop it on any of the newly created slots. Ot you can drop it on an existing item. Double-click an item with the right mouse-button. Right-click an edge of the center frame (not a corner), and the menu will appear. If you are in a group with someone that also have LootCount, you can watch items as a total. The most common use for this feature is to grind rep-items together with a friend. Both can then drop the rep-item on LootCount, and you will then read a shared total for this item. Now - if you in addition to this want to monitor your items only, you can drop the same item one more time and switch on local-mode for that item-watch. You can switch this off from the menu. If you place a usable item in LootCount, it will be displayed with a green border and will be activated by a single click. This is a handy space-saver for motes and certain enchanting reagents. These are items needed to complete a quest that you are on. So, if you don't have any items for any of your quests, this watch will display a questionmark. Just select it from the menu, and click the slot where you want it. You can place as many as you want, as they will always display different items. Right-click an item in the LootCount interface, and select "Set goal". Enter the number of items you need and press OK. The watch will now contain two numbers: One for the amount you have, and one for the number of items you still need. If you for a single watch want it to count only items that you have on your current character, you may want to switch on local-mode. 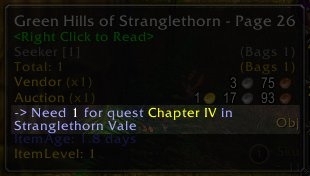 This would for example make sense with soulbound loot. Just right-click the watch and select "local". To lock LootCount, open the menu and select "Lock". This will disable moving of the interface and deletion of watches. You will notice the center frame turns red when it is locked. Each character has its own layout. There are also two global layouts available from the LootCount menu. These are common for all characters within a server and faction. Upon selecting a global layout, the center frame turns blue. Plug-ins are selectable from the LootCount menu. Any plug-in can be individually switched on/off from the addon-menu at the character selection screen in WoW to conserve memory. This plugin will show what the current cost for repair is, and the lowest durability of your worn items. This plugin can monitor your current level in a profession. It is made very simple (for my own use mostly), and will need to see a profession level-up message before it knows about your profession. A profession is selected by right-clicking the watch. Ever wondered how many kills you need to level up, or how many kills you need to get to the next reputation level? If you have, LootCount will tell you. Just select the option (REP and/or XP) you need from the LootCount menu and click one of the empty slots that just appeared. If you chose XP, that is all there is to it. If you chose REP you will also need to select the faction you want to watch. You do this by opening the WoW reputation window (shortcut "U"), click the faction you want to watch, check the "View as experience bar" option. The counter icon will contain two numbers. The bottom-right number will show an estimate based on the last mobs you have been killing, and the upper left will show you how many of the last mob you killed you will need to get to the next level. If you choose to switch zone or mob-type, LootCount will adapt and tweak the estimate within a number of kills. Faladrin for the initial code and idea for goal-functionality. so long dead? no updates? no one to fix the problems this it's plugins have? Re: Re: Re: Re: Set goal? This is a different addon. What you are looking for are most likely ad addon called "lootcounter". Re: Re: Re: Set goal? Thanks a lot Ybe, works fine indeed. And Grats on your Feat of Strength. Good health for the baby, mummy and much patience for getting up at nights for both of you. There's just a couple more minor things that needs to be checked thoroughly before it's ready for a release. Congratz with your son! Wonderful news. And thanks for the quick fix. No need to be sorry, you do this on your free time :] Also, congratulations to you and your other half on your new son! That's awesome news! Anyway, here's the hot-fix to make goals work again. All changes are in LootCount.lua in the Interface/AddOns/LootCount directory. An update will eventually come. This is just to give you some quick way to get it working until I can formalise it a bit better. Last edited by ybe : 11-29-10 at 01:55 PM. I wanted to leave a comment to let you know the set goal seems to be broken, but apparently I'm not the only who noticed. I really hope you can fix this, it's a really useful feature. I'm using 1.50a of cause. Last edited by Naexus : 11-10-10 at 03:57 PM. Hello there! Thank you for the great mod and updates! I would really love to see the goal function working again - that's my favourite part of this mod! Experiencing the same error as others unable to set goals. Thank you! Set Goal function is bugged. VOICEMACRO_4_Sc_1_FEMALE = "Help me attack!" If it's a fresh install, it's a big chance it will be hidden when loading for the first time. Type "/lc", and it should toggle shown/hidden. And if it's a fresh install, it should show up (after typing the command) at the middle of the screen as an empty green frame. Move it by dragging its corners. Ha! Got it! Works fine now. Just downloaded and installed and well, no joy. It's not working. I'm not even seeing it as an addon. No errors, nothing. Tried it with my normal addons, and tried it with all them turned off except this one. Same result, no errors, no warnings, nothing indicating it's even loaded. Verified that all files unzipped to the proper locations and everything looks correct. Was using "FarmIt" and it's broke as well. Really missing having this info on my screen. Last edited by Sandcrab : 10-19-10 at 05:59 PM. Yes, please update it! It's one of my faforite and I miss it!